I’ve been quiet online this month. Partly this is a result of life and bookwriting trumping blog posts. But also, in the wake of all that is playing out on our American stage — and my home city –, I have felt less like talking than listening. A month ago, when I was in New York, I stopped by the Brooklyn Museum to see the Kehinde Wiley exhibit. 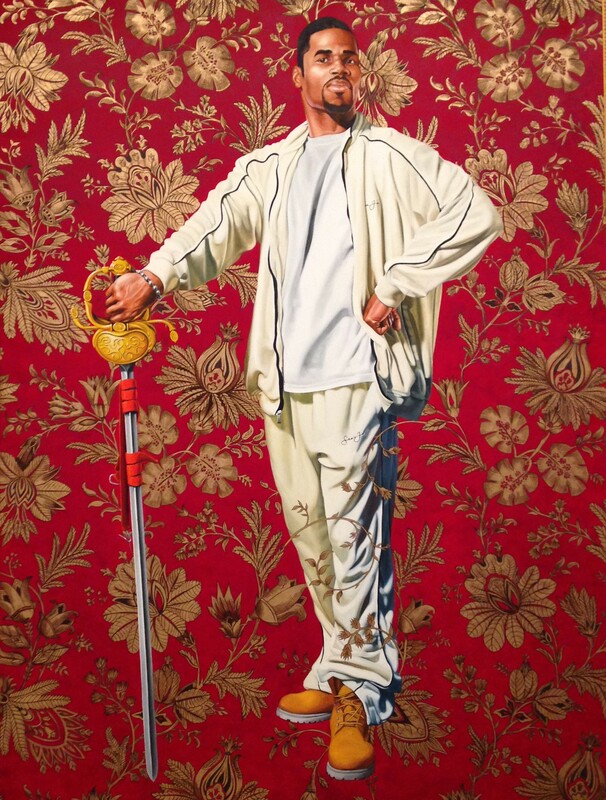 There’s been a lot of thoughtful discussion about his monumental botanically-inflected portraits, which showcase contemporary black American men in the poses of canonical European portraiture. The men — who Wiley met and ‘street cast’ for his portraits on American city streets — pose in the postures of Napoleon and wealthy white merchants and aristocrats. These are positions that assert visibility and social standing and power, and in Wiley’s portraits they insist on a rewriting of black men’s invisibility in the western history conveyed by art, and a rewriting of the ways we image black men now. There is a raw power in this project. A power to the resulting paintings, which are loaded with dynamism, and to Wiley’s process, which had him sitting down with ordinary men he’d met on the streets, pouring together through art history books and picking poses and paintings to replicate. What was it like to be in the room with those men, choosing image-making paintings to imagine themselves in? Ultimately, I wound up spending a good long while in a narrow little vestibule between two larger galleries, watching the projection of Wiley’s digital video piece, Smile. In the four-pane video, we focus closely on four African-American men’s faces as they smile until they cannot smile any longer. The experience probes the problematic ways American black men are compelled to smile — so as to seem compliant and unthreatening, as a survival technique, in the face of oppression — and the toll. As each man in the video loses his smile, he disappears and is replaced by another smiling face. It was intensely painful and emotional to sit with the video and the men’s wavering, strained smiles, the corners of their eyes and lips faltering with the awful muscle exertion of holding their expressions so long. Sitting on a little bench in front of the projection, I literally held my hands on my temples to try to keep my eyes from their repeated sympathy spasms and cried. A few feet away, in a dark corner, hung Mugshot Study. 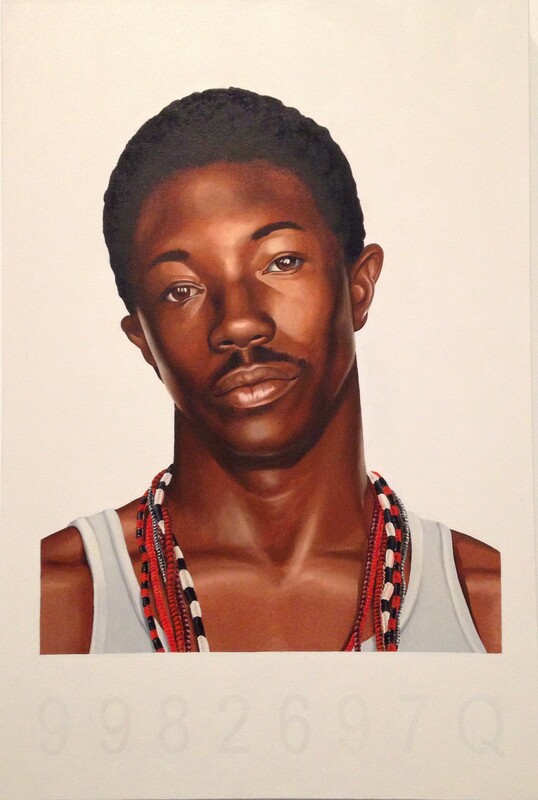 The piece originated in Wiley’s reflection that mugshots and wanted posters are among the most common forms of contemporary portraiture used to depict African-American men. His exploration of this particular form of portraiture feels poignant and devastating. The young man here is so young, and so vulnerable. Like so many others, I have been reading a lot about policing and prisons and the deaf persistence of the confederate flag and the fraught language of terrorism and race, and trying to listen intently and with great intention to the stories of all our citizens and to our president (again). This listening has been an important part of my practice of patriotism. 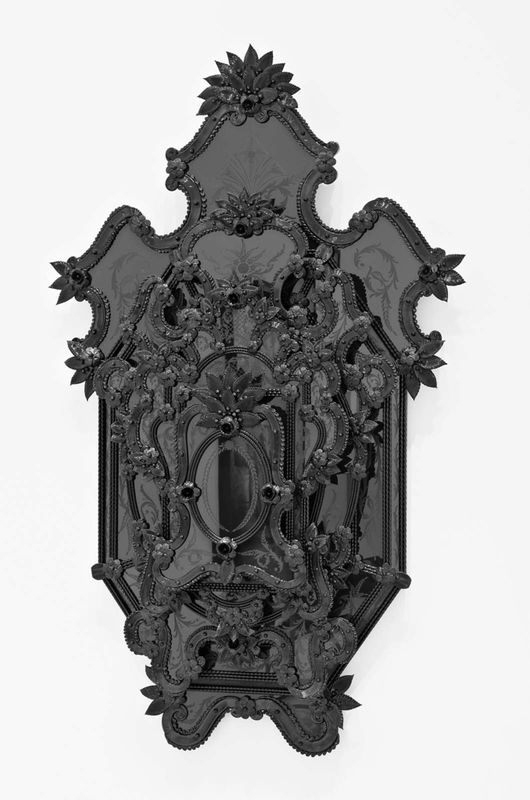 Last week I went to the Museum of Fine Arts in Boston and saw Iago’s Mirror by American artist Fred Wilson. The black-backed Venetian mirror is a reflection on the racial dimensions at work in Shakespeare’s Othello. But the piece draws into question not just the duplicitous Iago. For it is the viewer who is reflected in this black glass. We, too, are implicated in these questions of race. And because of that, we’re called upon to listen. Seeing Wiley’s work felt like a way to open up this listening. Fortunately, for those of you who live in Seattle or Fort Worth or Richmond, Wiley’s retrospective exhibit will be coming through your cities in the next year, and so you’ll be able to invite this work into your listening, too. 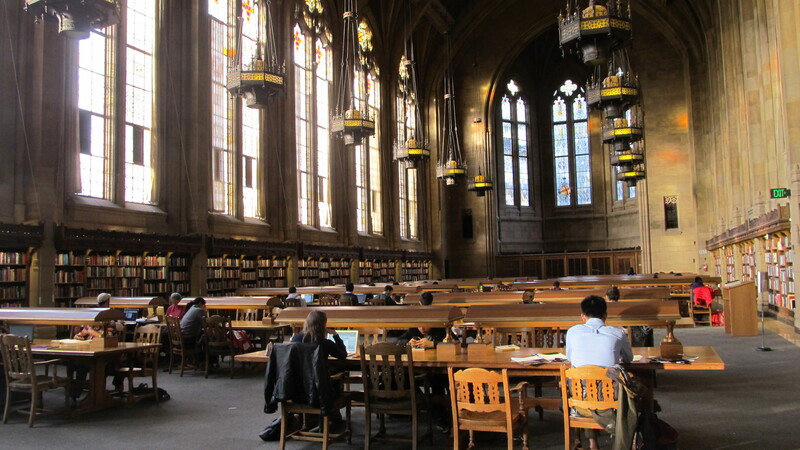 As I’ve been walking through the University of Washington campus this week researching for a story in my collection that’s set, in part, here in Seattle in the 1930s, it’s occurred to me that my father’s father was a student at the University of Washington not much after that. My father’s father, who died a few years ago, wasn’t one to share much about his past. 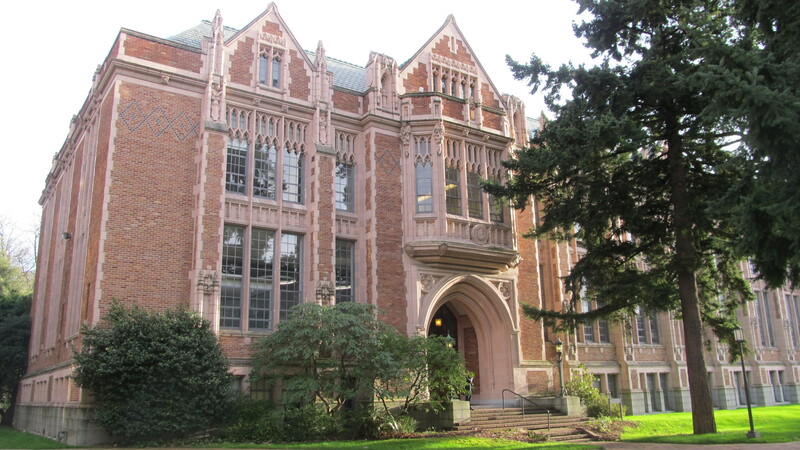 But he came to school here at the University of Washington as a newly orphaned teenager. He played the flute and the piccolo and diligently studied science. In just a few years his life would take an entirely new arc: he’d join the army, study medicine, go oversees, settle east. In subject and content the stories in my collection have nothing to do with my family. Yet the idea for the first story sparked from a letter my mother’s father wrote home from wartime Hawaii. By coincidence, through the winding intricacies of research, the last story in my collection has led me to Seattle. Somehow, twelve years and 3,000 miles later, this book that started with the letters of one grandfather has now brought me to the other. 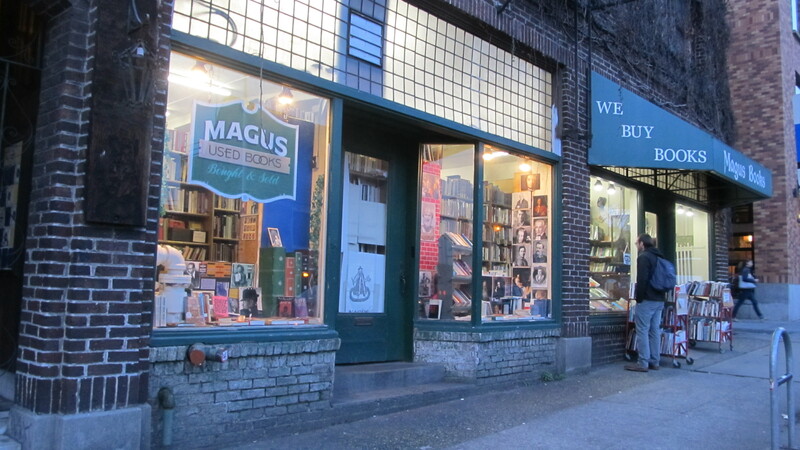 The other bookstore I visited in Seattle is Magus Books. 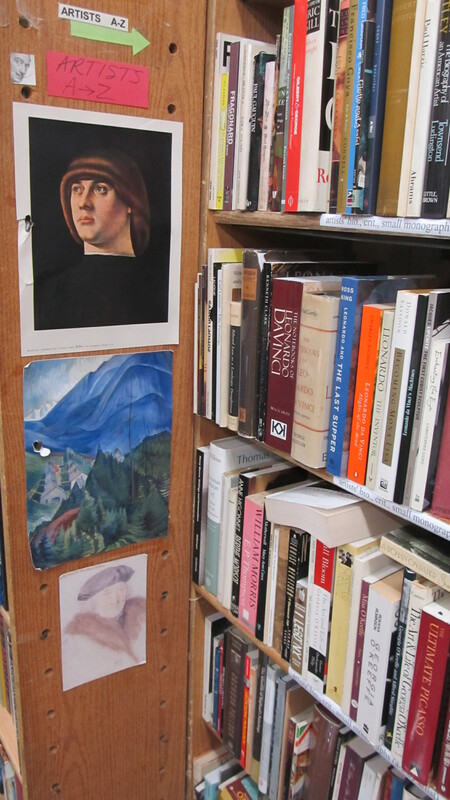 Just steps from the University of Washington campus, Magus Books has an extensive collection of used books in this old, vine-laced bookshop. 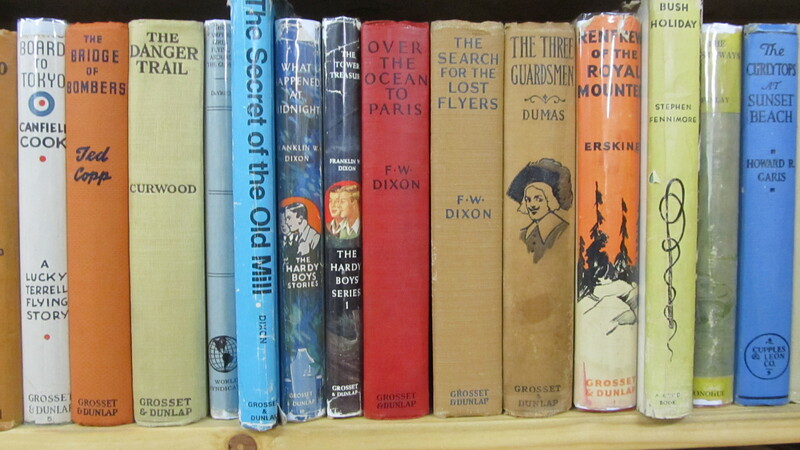 The shop is especially strong in its older hardcovers. There are bookshelves full of well-cared for gilded spine collectibles and classic hardcovers complete with box sleeves. I really like how they mark the beginning of each section with related prints and images. 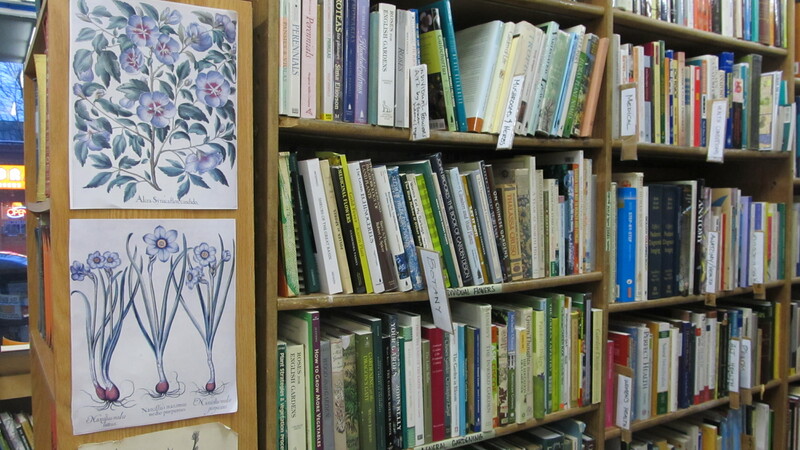 The day I was there I was especially drawn to their botany and birding and antique book collections, along with their impressive art books. I found one on Stuart Davis and another great one on Henry Moore that I wished I could fit in my luggage. Not to mention a couple more children’s novels and pocket books I really wanted. 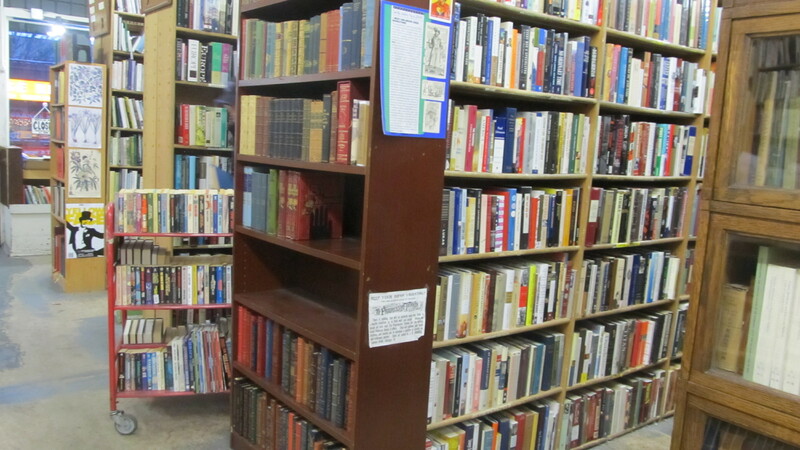 One of the aspects I liked best about this bookstore is its knowledgeable and thoughtful staff. I had a great conversation with the man working there that day about various older book series they had on display, and really admired his expertise and low-key generosity. I liked this bookstore and Elliott Bay Books for different reasons. The two are a terrific balance. Magus is another one of those bookstores I wish I lived close to. It’s the kind of place where I think if I dropped by every so often, I’d light on something different each time. 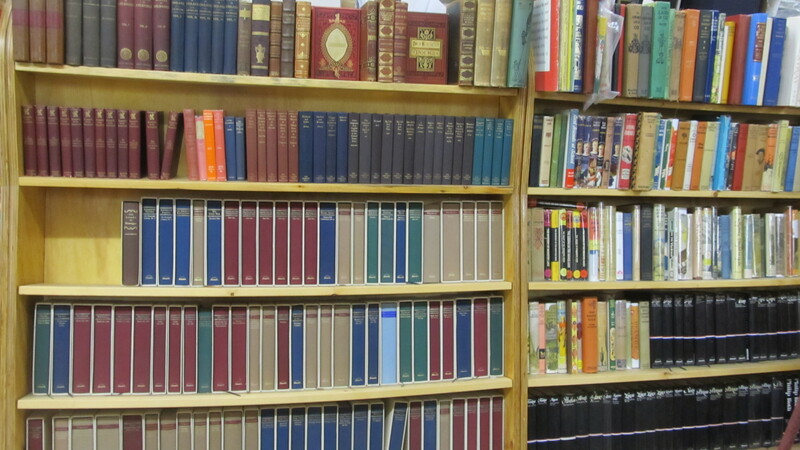 And I have so much more I want to talk over with these booksellers about early 20th-century book publications. *Yes, I did already violate my prohibition on buying books on this research trip. I really don’t have any spare room or weight in my backpack during these nomadic next few weeks, so I’ll have to ship this one home to myself before I leave Seattle…. 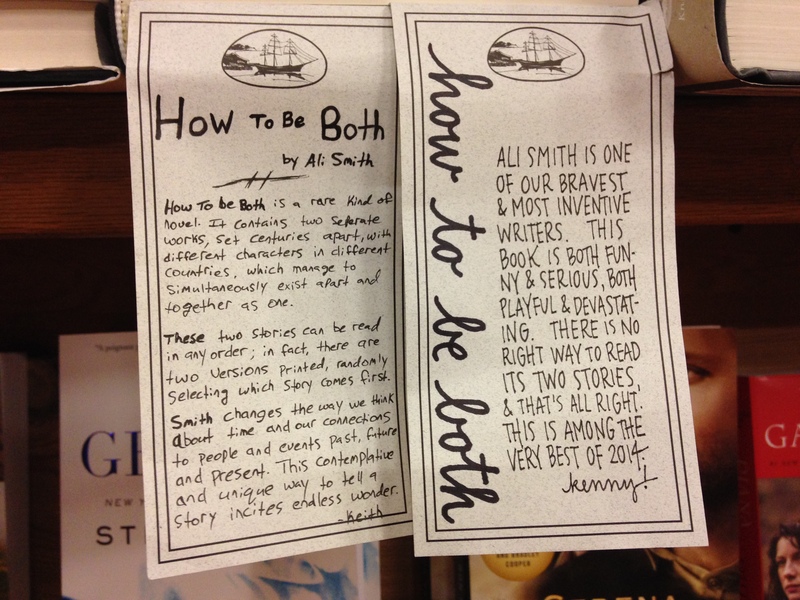 Not buying books (or supporting these independent bookstores) is lousy! One of my research stops in Seattle was the Asian Art Museum in Volunteer Park. 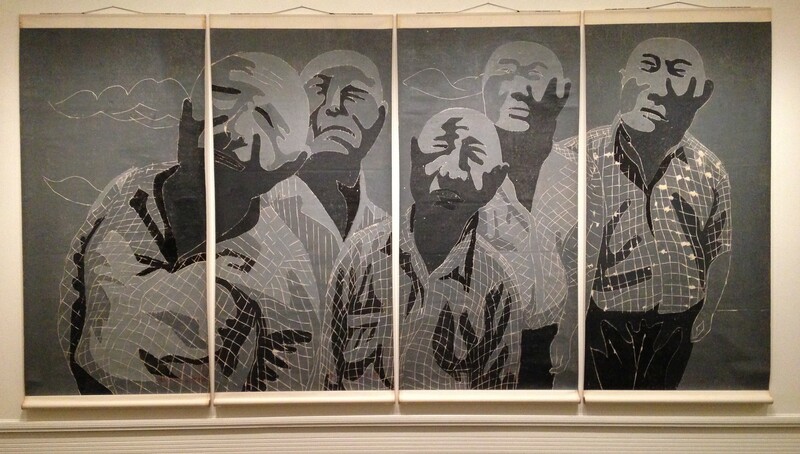 I was primarily there to visit some of the older pieces in the collection, but I stopped into the contemporary galleries, too, and was completely captivated by this large-scale woodblock print No. 19 by Chinese artist Fang Lijun. I really like the linear textiles contrasted against the soft sinuous shadows. The piece renders its figures with such sensitivity — and on a monumental scale. 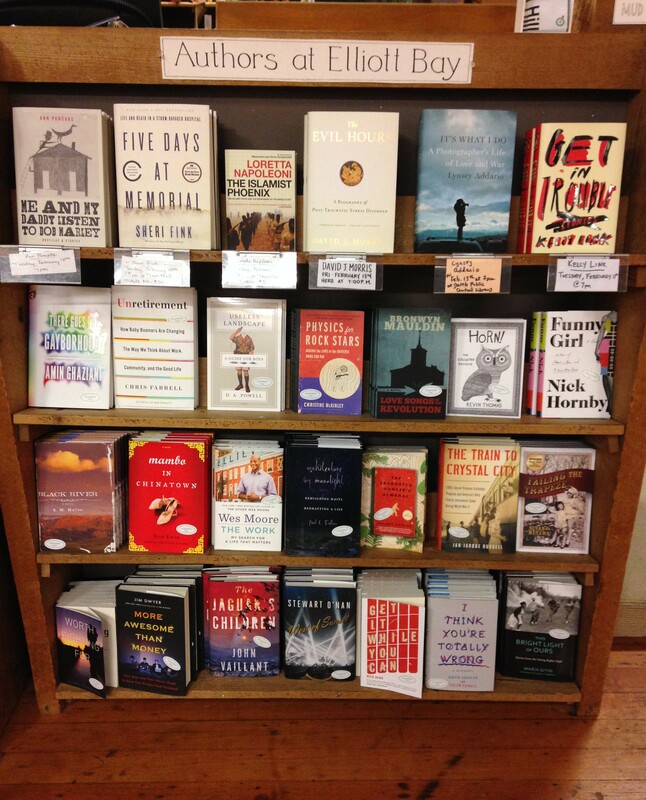 After some research meetings the other day, I stopped at Elliott Bay Book Company in Seattle. 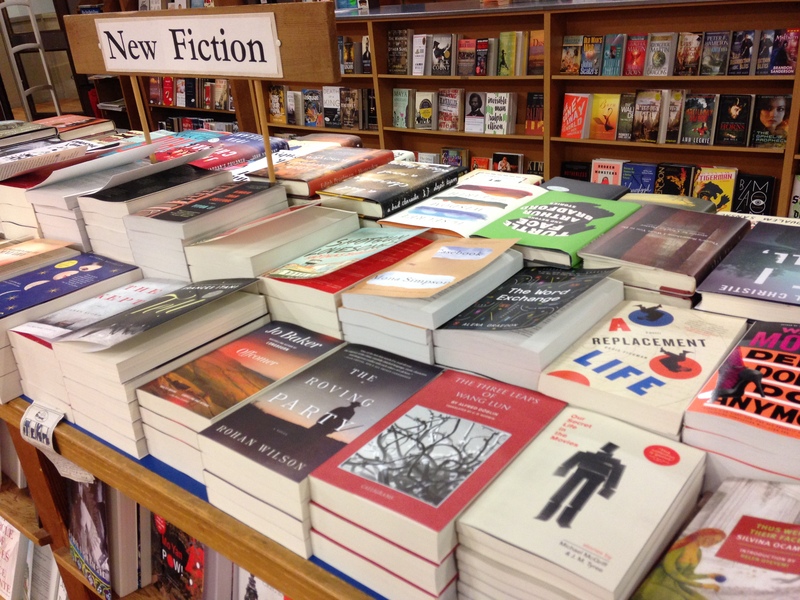 Their New Fiction table and staff recommendation shelves reflect an unusually broad and sensitive reading of new book releases. Their staff has pulled together recommendations that not only include the books that are currently getting a lot of attention, but also a rich collection of new books that I hadn’t yet heard about. 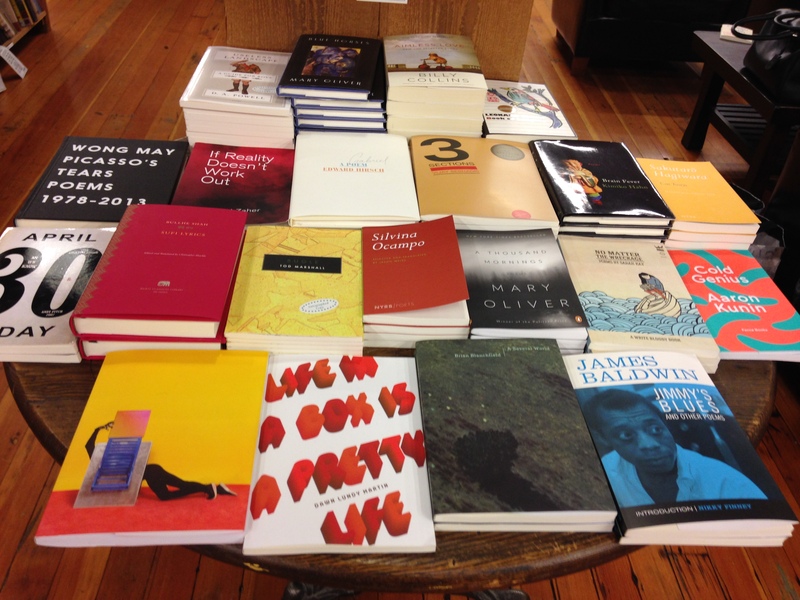 I felt like the two hours I spent there were completely absorbed in taking in these tables of new titles. Being there felt like an important part of my work as a fiction writer. 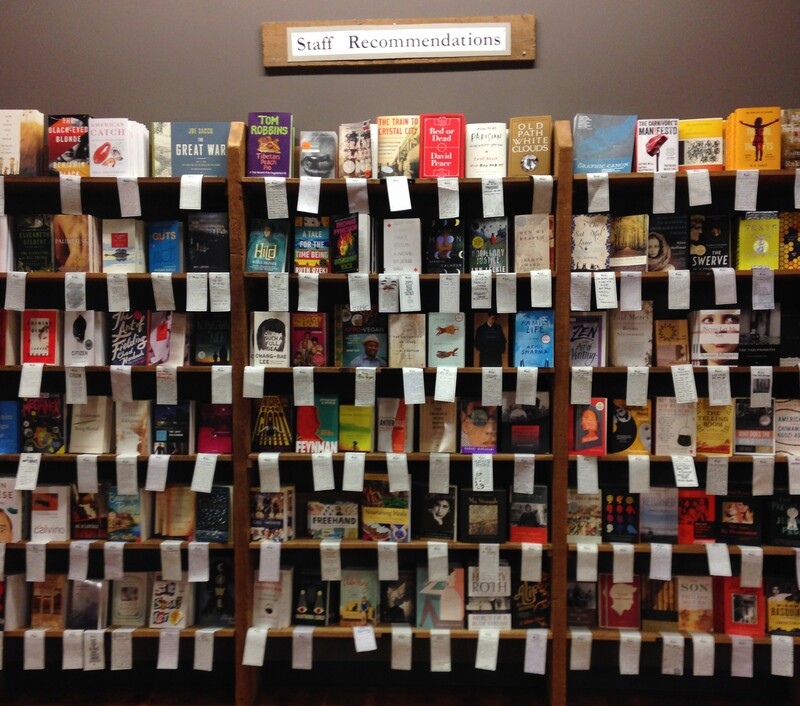 They have extensive staff recommendation shelves — the largest staff recommendation section I’ve ever seen, peppered with some especially lovely and evocative description cards. And even beyond the usual sections of staff recommendations and new releases and bookclub suggestions, there are themed tables and endcaps upon endcaps of interesting selections. 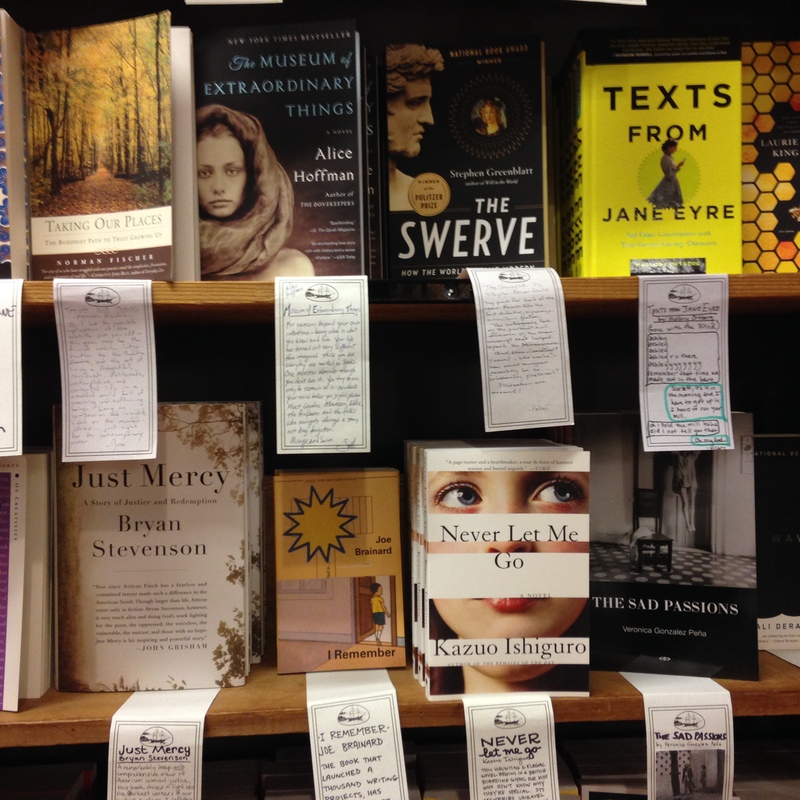 Elliott Bay Books’ tables and shelves feel like a cross between a great reading list and a Maureen Corrigan book review. 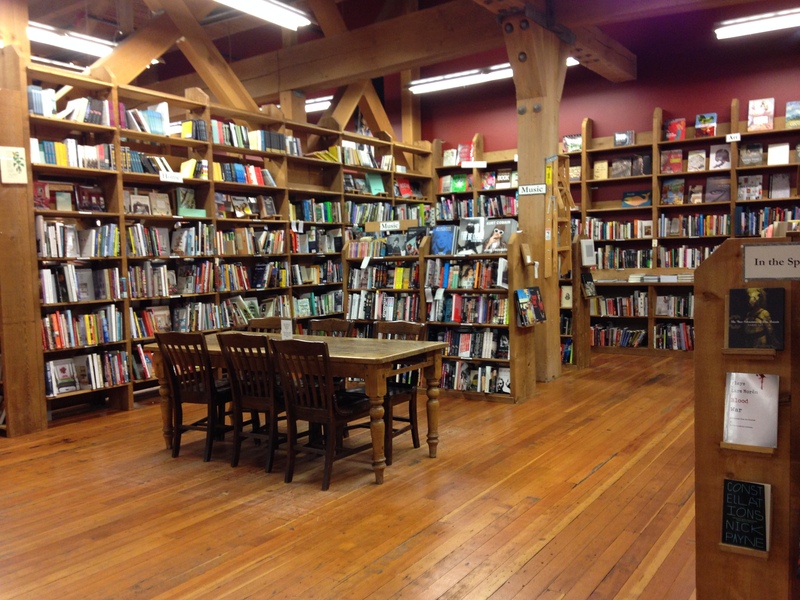 The bookstore is also active in supporting local and contemporary writers: Elliott Bay hosts an extensive reading series. 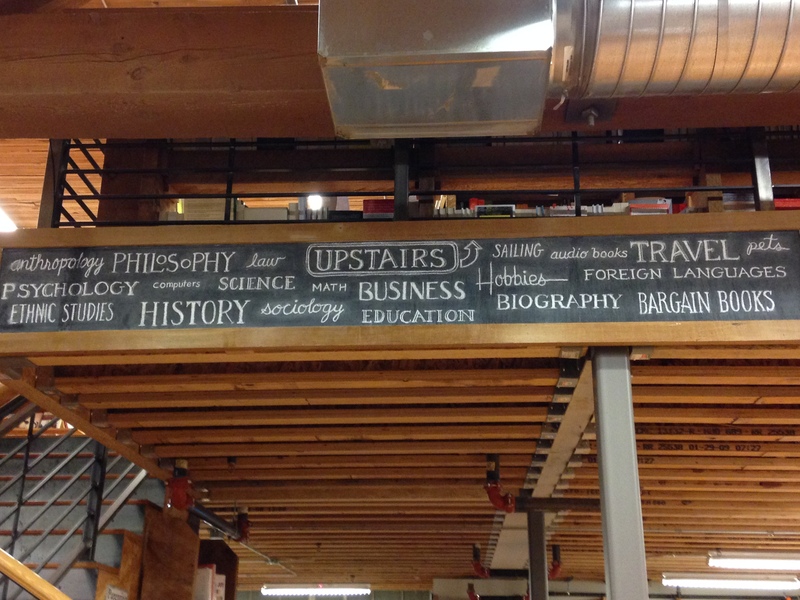 (Even while I was there, a staff member was updating their chalkboard with details on the next night’s reading.) And augmenting this effort to promote contemporary writers, they publish two newsletters — a monthly event guide to upcoming readings and a seasonal gazette full of book recommendations. In addition to all that, Elliott Bay has impressive selections of art magazines and literary journals, and a whole table devoted to poetry collection highlights (which I’ve found is always a hallmark of a good bookstore). The store itself is beautiful — huge and full of rich, warm wood floors and wooden beams. There are two floors of books and a lower level just for their readings. I wish I lived closer to this bookstore so that I could stop here more often to replenish my reading list from their selections. And I really wish I could have picked up a handful of books here during my visit. On this research trip, I have to keep my pack light, so I really can’t carry books. It killed me though. There are at least half a dozen books from Elliott Bay I’m eager to read — and it’s so important to support independent bookstores. Fortunately, they do sell online, so an order is certainly in my future when I get back. 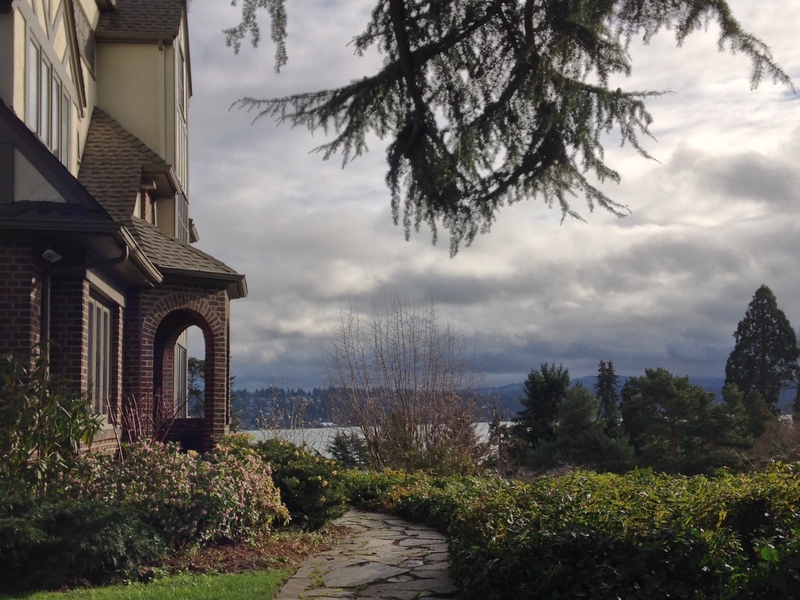 Walking to a research meeting in Lake Washington the other day, I stumbled into this view. It looks like it comes from a storybook. 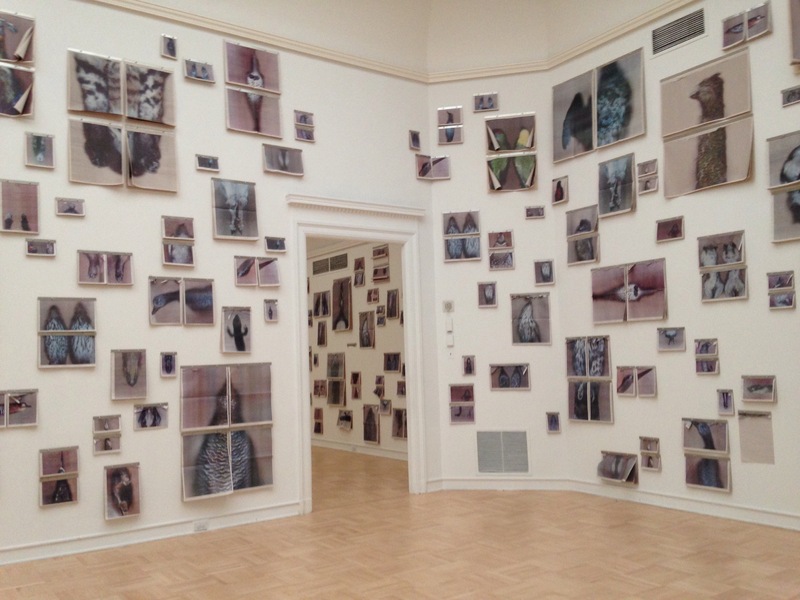 During my research visits to the Henry Art Gallery in Seattle, I swung into the galleries to see the current museum-wide installation by Ann Hamilton. 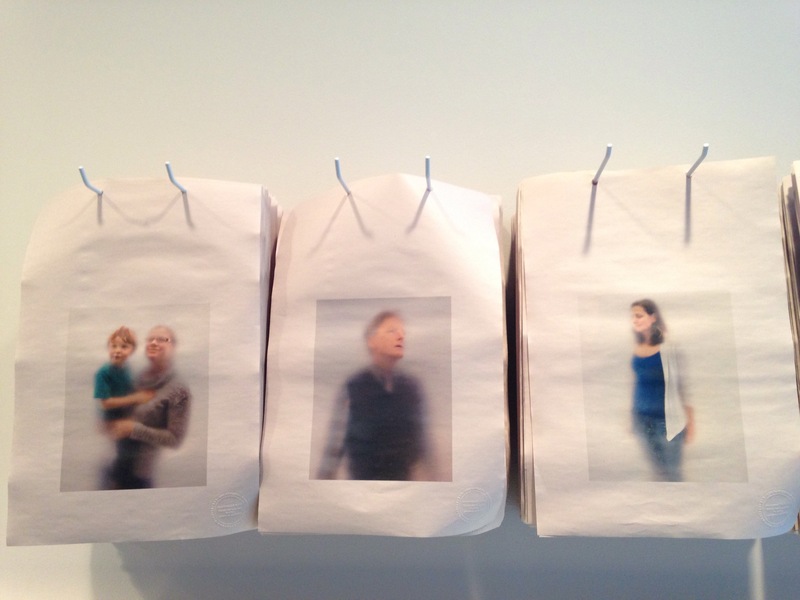 This new work pulls together a number of threads. Among them, Hamilton explores how the sensation of touch plays out across a range of ideas and experiences. 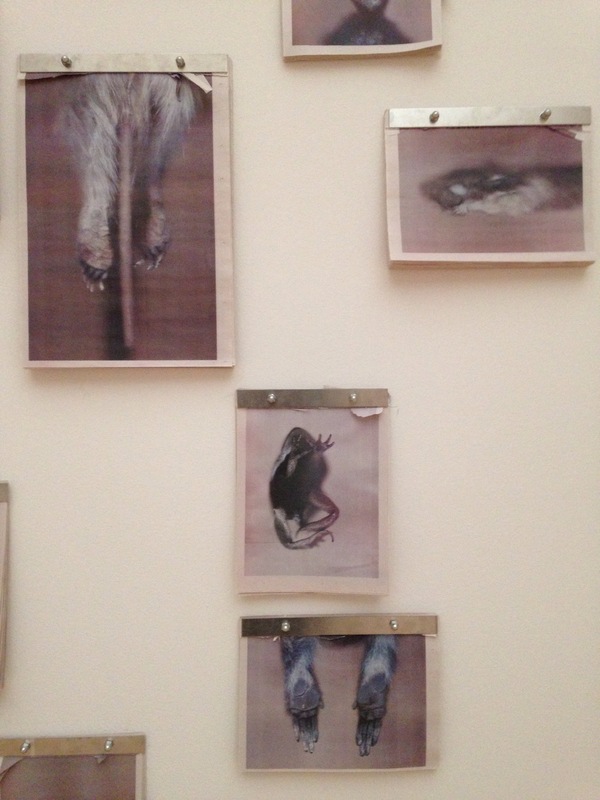 Influenced by the University (where’s she’s currently artist-in-residence) and its natural history collections, Hamilton pays close attention to animals and their furs. 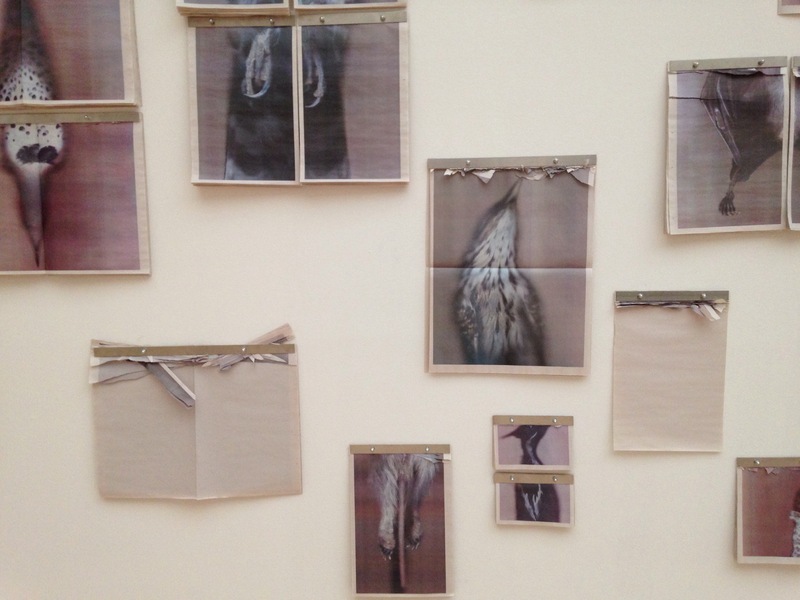 In several galleries, she hung reams of newsprintted animal images, which exhibit viewers are invited to peel down as keepsakes. The display calls to mind the older chambers of wonders model, where art and natural collections co-existed. 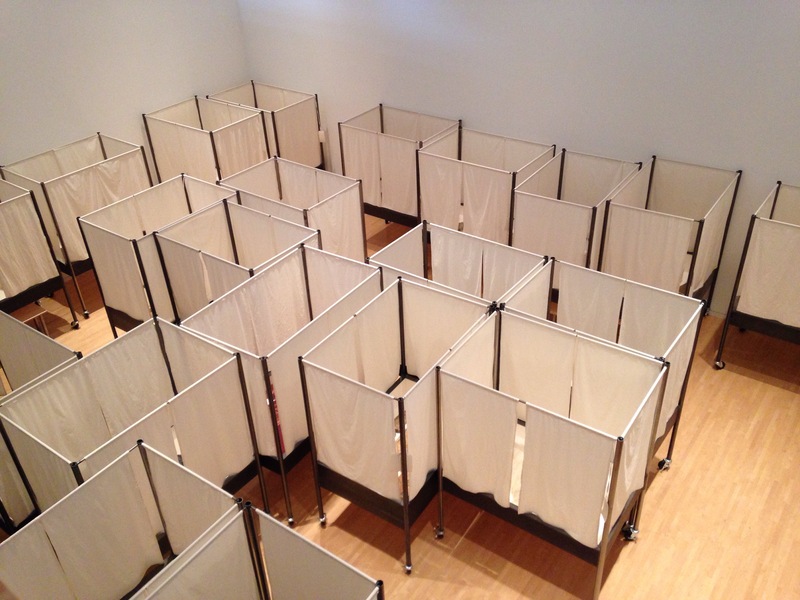 In the museum’s basement, Hamilton approached this same theme from a different lens, creating linen-walled cubes, each containing furs in glass cases. Handwritten manila cards tied to each cube echo specimen cards, and more potently, morgues. A second major thread Hamilton explores here is the longtime tradition of the common book. Aware of the way this exhibit draws together and links ideas, Hamilton creates a meta experience of idea collecting within her installation. Exhibit visitors collect not only collect the newsprint animals from the gallery walls, but also quotes on touch that are placed throughout the exhibit. Hamilton is lyrical and astute in her written descriptions of this project. 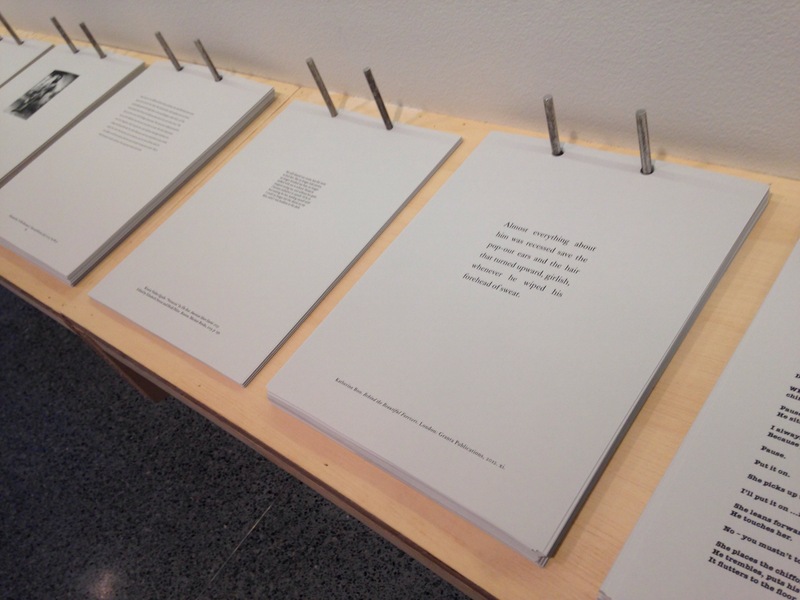 And there’s a lot of interpretive text in this exhibit, a lot of conceptual frameworks to work though. The choice to include extensive signage may have to do with the exhibit’s home at a university art museum where the work is meant to be engaged with repeatedly over a longer timeframe — and to become a part of a larger pedagogical discourse. At times, though, I wish she had offered less explanation of the rich concepts she’s explored. I would have liked to let these disparate threads coallese more organically, to allow the exhibit to work through inference more. The work is strong enough for Hamilton to trust in its experiential rhythm. 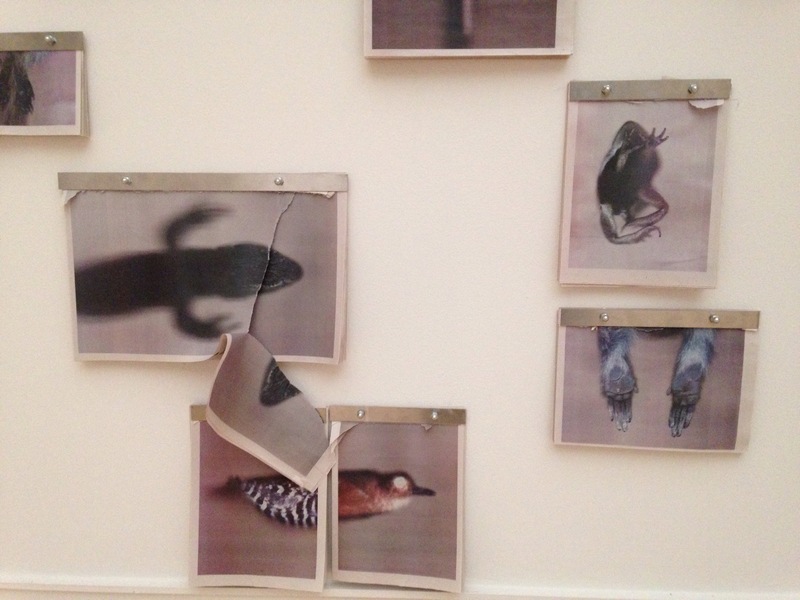 You also get the sense, though, of an artist exploring an assortment of new elements in her work and inviting us into the recesses of creative process. The sense that she’s gathering together ideas that are still more divergent than synthesized — and that this experimentation ought not cohere too soon.